A multi-platform presentation of performance projects that engage archive as medium, “Performance Archiving Performance” offers the opportunity to reassess the role of archives and the museum’s responsibility for their evolving forms. Performance archives seek to preserve a legible record of live art for future study; however, many argue that archived representations of performance cannot fully capture the nuances of ephemeral experience. Projects by a canary torsi, Jennifer Monson, Julie Tolentino, and Sara Wookey acknowledge these concerns by conceiving of the relationship between performance and archives as a unique system. 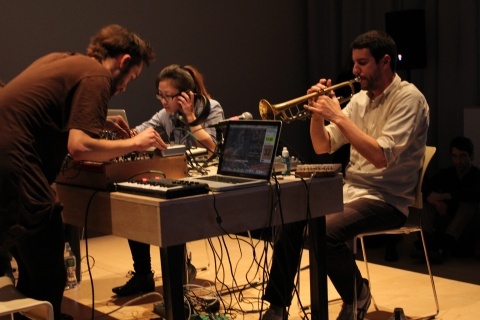 Within these projects, the acts of recording, storing, indexing, and redistributing are as much a part of the work as the performance itself. As a result, the site of performance—its position in time, space, and form—is placed in question so that the actual process of archiving may be interpreted as its own mode of performance, its own singular event. “Performance Archiving Performance,” a presentation of projects that engage archive as medium, is organized by Travis Chamberlain, Associate Curator of Performance, and on view in the Fifth Floor Resource Center from November 6–January 12. “The People to Come” is a project by a canary torsi, a group led by Yanira Castro whose work is anchored in live performance and extends into other media and online platforms. “The People to Come” is comprised of a website and performance installation, both of which are activated by a conditional relationship to the participation of audiences through a meticulously designed archiving system. By submitting a response to a prompt on the project website thepeopletocome.org, audiences provide inspiration for dancers who organize those submissions into scores. These scores are interpreted into dances, which can be observed in rehearsal, and performance as part of a live installation. Video documents of the performances are subsequently archived on the website alongside the original audience submissions, providing a lasting online portrait of the audience’s engagement with the project’s unique archiving mechanisms. a canary torsi will stage the closing of the online archive for “The People to Come” as a real-time archiving installation in the New Museum Theater, on view from December 11 and culminating in a special concert event on December 15 at 4 p.m.
Jennifer Monson’s “Live Dancing Archive” consists of three components—each constituting a specific approach to the practice of archiving ephemeral phenomena such as dance and the ongoing flux of environmental systems. These components include a video installation, a digital archive at livedancingarchive.org, and a solo performance. The solo drawn from the contents of the digital archive establishes connections between Monson’s work in the ’90s, when her involvement in queer activism was affecting her choreography, and recently developed strategies to investigate phenomena such as animal migrations, geological formations, and watersheds. Placing natural ecosystems and archival systems in tandem, “Live Dancing Archive” sustains the choreographic processes of the artist in a dynamic relationship with the shifting environments that shape her research. Founded by Sara Wookey, “reDANCE” is a platform for public engagement that features processes and re-enacted works of renowned choreographers of the Judson Dance Theater era performed by another generation of dance artists. Built as a kit-of-parts, and malleable and scalable depending on the needs of individual institutions and their audiences, “reDANCE” explores the immateriality of dance and its archival practices through live performance, workshops, and discussions. Topics include choreographic methodologies, generational transmission, adaptation, and reconstruction. Frequently presented within visual art institutions, “reDANCE” strategically initiates dialogues around legacy and impermanence in live art across disciplinary boundaries. For more information, visit redanceproject.org. Exploring the body’s potential as both a medium and container of record, Julie Tolentino’s “The Sky Remains the Same” invites select collaborators to choose a work from their own performance history to archive into/onto the artist’s body. Anchored by individual contracts between Tolentino and the subjects of her archiving interest (who include Ron Athey, Franko B, David Dorfman, David Rousseve, and Lovett/Codagnone), each iteration of “The Sky Remains the Same” necessarily redefines the elements and processes for archiving a performance into/onto the body of another. This work produces a map of body-specific, contextual, and practical differences between each performance and its archive. Perhaps the contents of performance archives should not be valued for how closely they resemble the thing they seek to preserve, but for their fidelity to delineate difference. For more information, visit julietolentino.com. Julie Tolentino will archive three works selected for her by the artists Lovett/Codagnone, presented as part of a residency for “The Sky Remains the Same,” November 11–24 at the New Museum. The archiving process for this particular group of works is constituted by a series of open studios, panels, and public performances. November 23 – “The Sky Remains the Same”: How Do You Map the Sky?